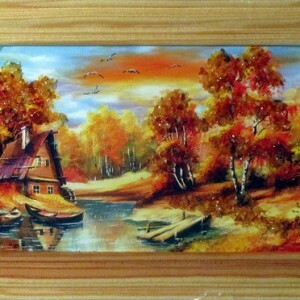 Another new trend becoming popular in decorating are amber pictures. Amber is a sticky resin that oozes from pine trees and over time fossilizes into what we know as a semi-precious gem. With its majestic properties and unique characteristics, amber makes the perfect addition to any artwork collection to really take your designs to the next level. If you want to guarantee that your artwork has something different to it, something to truly alternate the image, then amber pictures are the best way to do just that. Originally used in Russia, Lithuana, and Poland, genuine Baltic amber nuggets are used along with paint to create amber pictures. These pictures range from scenery to animals to shipwrecks. It has long been believed that amber holds a magical, sacred properties. Looking at amber pictures with the gorgeous golden hue, one might become a believer. Amber is a popular item to be used in jewellery and pictures because it creates such a unique quality about the image behind. It’s natural beauty was noticed in the Neolithic times, and has held a huge value within the art community ever since. Its used in everything from fragrances to folk medicines, and holds a rich position within many different cultures through human history. If you want to make sure your artwork is covering all bases, then you need some framed amber pictures in there to really complete the set!